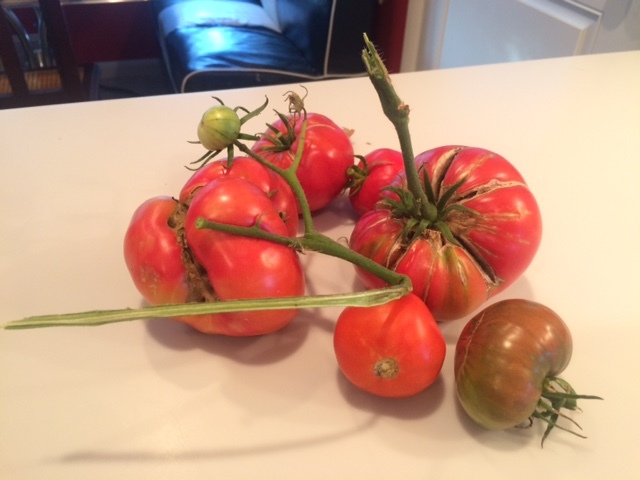 Remarkable providences: A November tomato harvest? This is most unusual: a fresh tomato harvest on November 1, and no clear signal of a hard frost anytime soon. Yes, it’s strange. Frequently, we’ve already had a little, or even a lot of snow and/or a sleet storm on the Front Range. Officially I think we had at least one overnight hard frost last month, but our tomatoes are in a south-facing garden against a very heat-retaining and radiating brick wall. That, plus the fact that at this altitude, we rarely get to eat our own tomatoes until September makes these tomatoes very welcome. My gardener/husband reports that the tomato plants are still getting blossoms, so maybe these aren’t the last of the season? Now that would be remarkable and alarming in equal measure! ← Teaser Tuesday: What was it like to visit the Château Saint-Louis? I heard an eerily similar report just last night from an East Coast, southernish, reputed “swing state.” I verily take it for a sign, a marvelous providence. Who needs a “firewall” when you can deploy millions of greenish, vine-crawling pomo-doros, slithering from California to the New York island, inconspicuously siphoning the rouge out of the soil itself. Or even conspicuously, to the extent that these reports begin to proliferate. This is taking “rigged” to sub-molecular levels. Lock it in, is what I say. Verily, not fluff! It is one of my many quirks that I dislike raw tomatoes. To me, the only acceptable way to eat them is as a soup or sauce where they’ve been pulverized beyond recognition. But many years back, when I planted a yearly garden, I always included at least two tomato plants. Because I truly loved the plants themselves. They have a subtle but very attractive scent, and I was perfectly content to tend them while others enjoyed the resulting fruit. Here in SE Michigan, where there is no “normal” weather, I’ve endured many a frigid early November. I’m thoroughly enjoying the mildness while it lasts.